A supernova explosion flung out a super-dense, whirling stellar core, sending it streaking across space at almost 2.5 million mph (4 million km/h) with a glowing trail 13 light-years long in its wake. Researchers tracked the stellar core, called a pulsar, using NASA's Fermi Gamma-Ray Space Telescope and the National Science Foundation's Very Large Array (VLA) astronomical observatory. The pulsar is about 6,500 light-years from Earth and was first discovered in 2017 by a citizen science project, Einstein@Home. It is moving fast enough to travel from Earth to the moon in just 6 minutes — 5 times faster than the average pulsar moves, and faster than 99 percent of pulsar speeds previously documented by researchers. Scientists described the pulsar as a cosmic "cannonball" in a NASA statement. "Thanks to its narrow dart-like tail and a fortuitous viewing angle, we can trace this pulsar straight back to its birthplace," Frank Schinzel, a researcher at the National Radio Astronomy Observatory in New Mexico, said in the statement. "Further study of this object will help us better understand how these explosions are able to 'kick' neutron stars to such high speed." 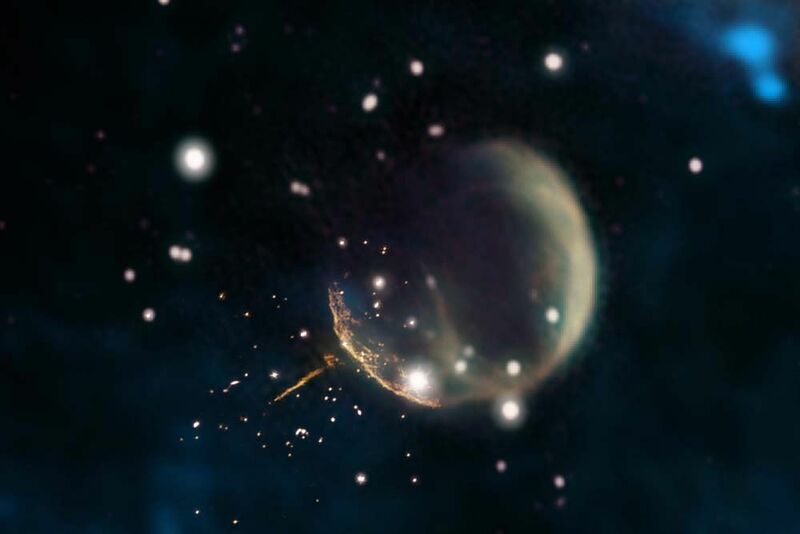 The pulsar J0002+6216 streaks away from the bubble-like supernova remnant CTB 1. This composite image combines radio, visible light and infrared data. CTB 1, if viewed in the night sky, would appear to be the size of a full moon.